My November 2016 Feline Sampler Box features feature warm colors, earth tones, and the idea of giving thanks, feeling safe, warm, comfortable, well fed, with family or loved ones. Click the photo to see an enlarged version. 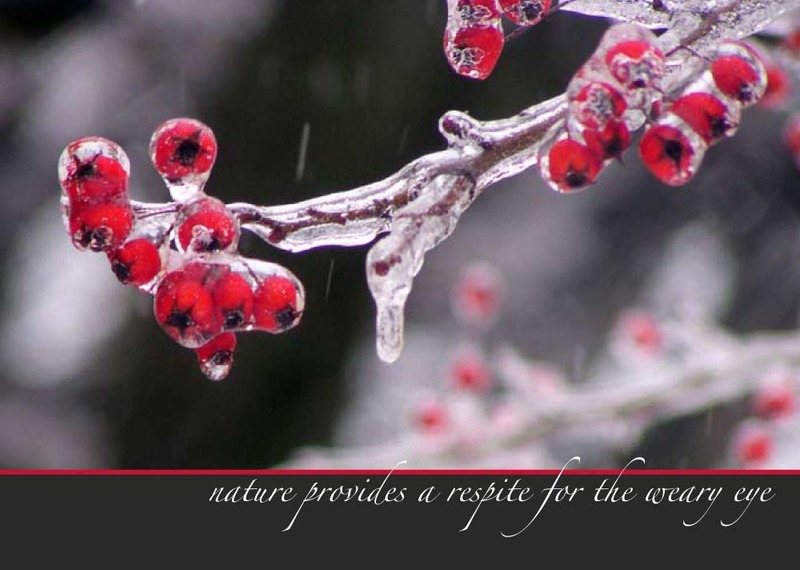 Icy Berries, part of the “Unexpected Berries” set of cards. “Back to Front” pendant, 1″ x 1.5″ oval on multi-strand cord. I choose contents to give you the most variety in each item. I take into account not only item but style, medium, size, subject,—even a particular feline subject, color or coat pattern, or a particular anniversary with one of my feline family—as well as season, holiday, color palette and the message it sends, as with greeting cards. 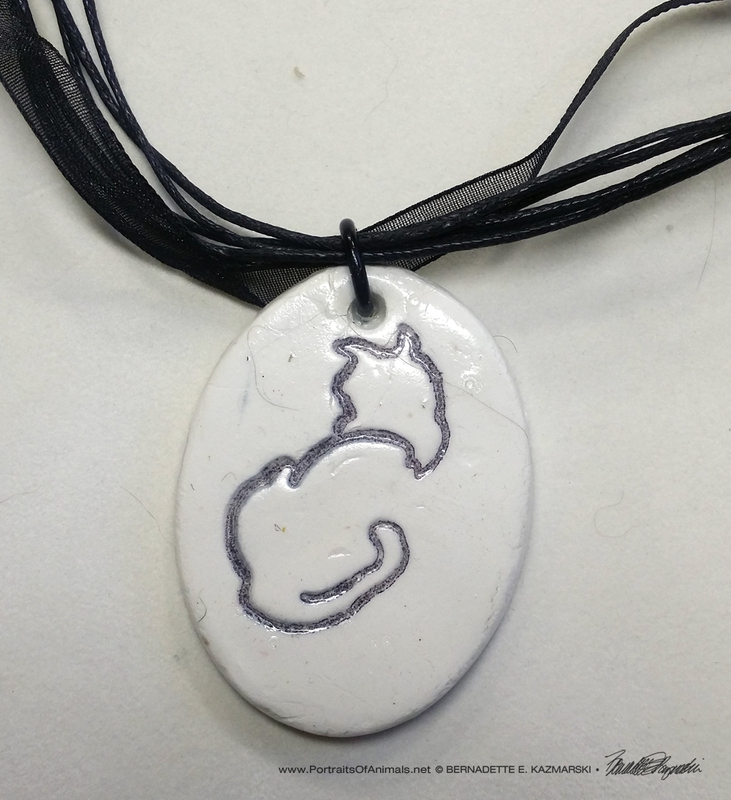 You’ll see a good sample of not only my work but also the beauty and inspiration of felines so that, whether you keep the contents for yourself or give them as gifts or donations, you’ll find something that fits nearly every occasion. Below the list of contents you can read more about each of the items and why I chose them for this Sampler Box, and a link to the item on Portraits of Animals. 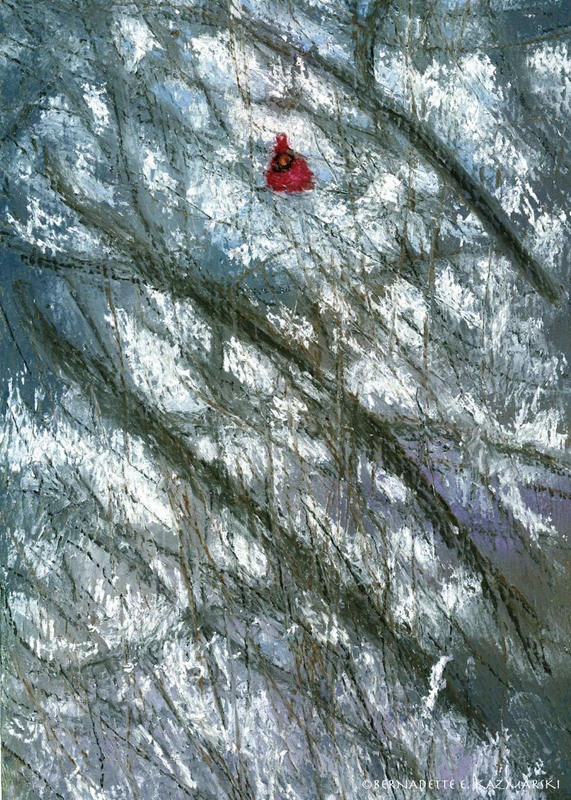 This portrait changed my world, as an artist and in my career. The day I finished this portrait in 1997, I knew I had reached a higher level of skill as an artist and a deeper level of visualization combined with that skill that goes way beyond reproducing what I see, very far into what I feel. Stanley was a difficult soul having been abused before he was dumped outdoors, but his real personality was sweet, fun, silly and relaxed, and for all his issues I loved him completely. In this scene, though he rarely relaxed at that time, he’s dozing off in the sun in the after dinner nap he enjoyed just about every day, I found that part of him, and that part of me, and got it onto the paper. 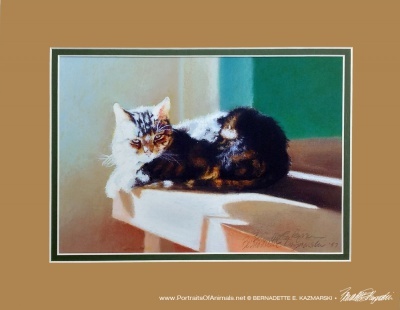 It’s been magic since then, not just with my portraits and other animal artwork, but with all my artwork. I may have arrived at that point as an artist eventually, but it was my deep feeling for Stanley that delivered me to the door, which I had only to open. Visit After Dinner Nap for more about this painting. The print is 8” x 10” and I’ve matted it with gold and green mats to fit into an 11” x 14” frame. 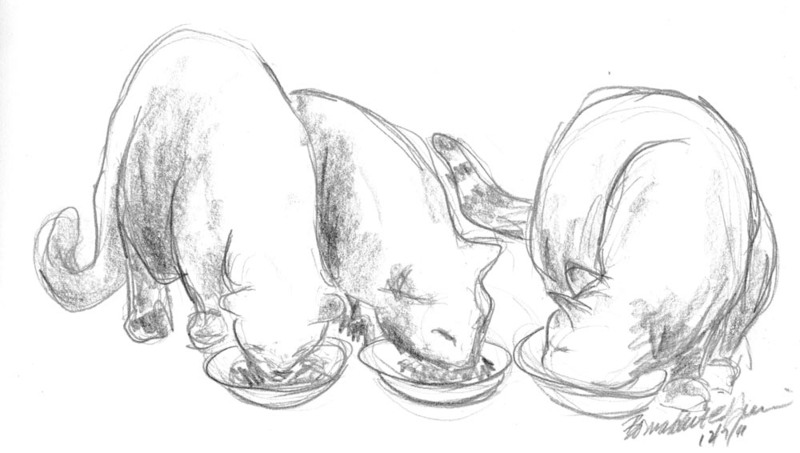 You can also find “After Dinner Nap” in my gallery of feline artwork. 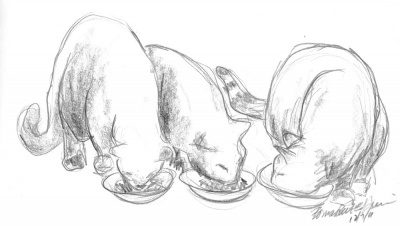 Here is one of my favorite sketches, the third daily sketch of over a thousand, from way at the beginning of my series of sketches beginning on December 4, 2011, and one of the few to include Cookie. It’s Kelly, Mimi and Cookie enjoying dinner on the evening of December 7, 2011. Nearly all my daily sketches are “in the moment”, not made from photos and usually not from memory. They catch the real events from our days here, and for that reason, just as photos bring back memories as you flip through them, of that moment and of that time, each of my sketches also brings back memories, but with far more detail. Possibly because they touch many more parts of me. Read more about Dinnertime!. 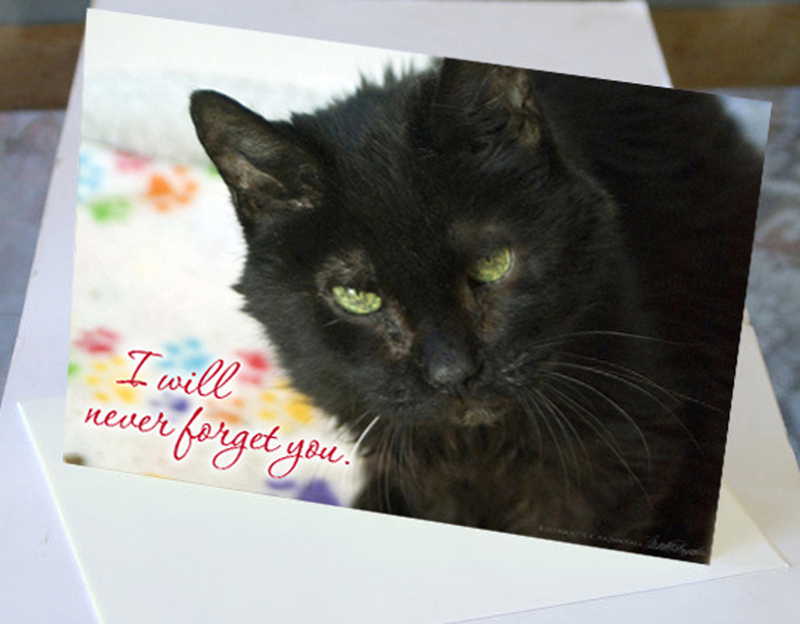 The sympathy card for this month, “I Will Never Forget You”, recalls my 19-year-old foster/hospice rescue, Emeraude, who was diagnosed with lymphocytic leukemia in November 2013 just as she was beginning to feel good and enjoy her new life here. Though she was only with us for a short while, we will never forget her, and she is a member of our feline family forever. The art card is “Peace” on “Earth”, for the many people who live with both cats and dogs, and the message is more clear if you look a little more closely at their markings. 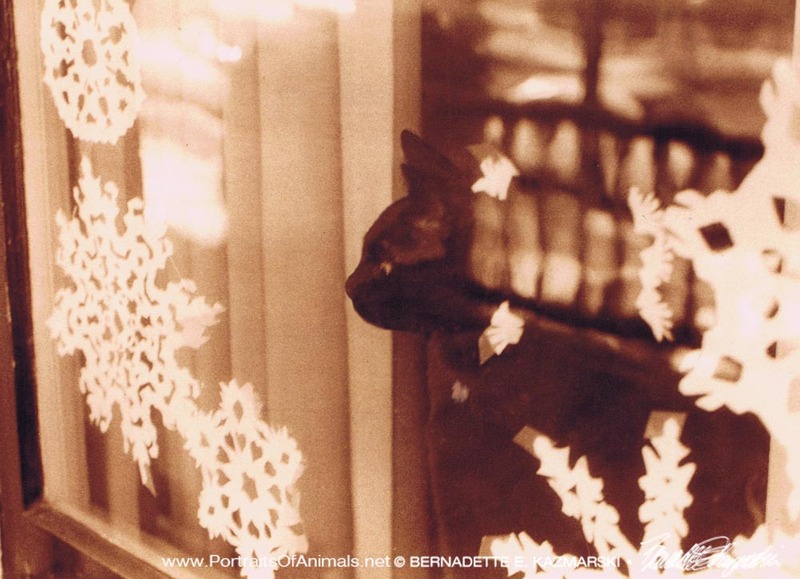 “An Old Memory” is the photo card and the wavy glass, the pensive cat, the cut paper snowflakes and sepia look all have an feeling of bringing the past to the present. This month’s non-feline cards are two from my holiday sets of cards, “Icy Berries” from “Unexpected Berries” and “Accent” from “Backyard Birds” because I know many of you also appreciate out backyard visitors as well as the beauties of nature, even if they are covered with ice. 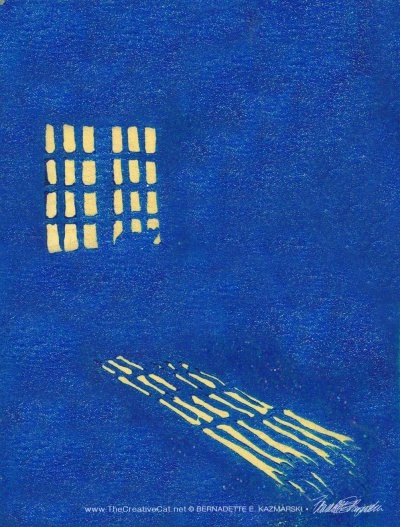 And as the note card I’ve included a hand-printed card, “Window Kitty, Snowy Night”, a limited edition linoleum block print card, printed on yellow card stock and glazed with opalescent glitter glaze to capture the feel of snow falling on a cold night. 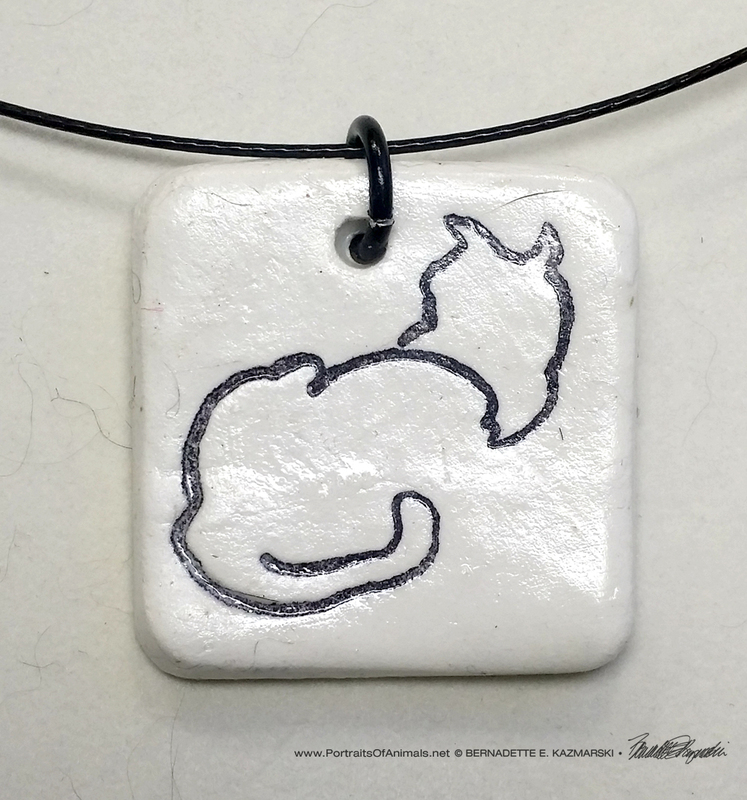 “Back to Front” pendant, 1″ x 1″ round on flocked cord. 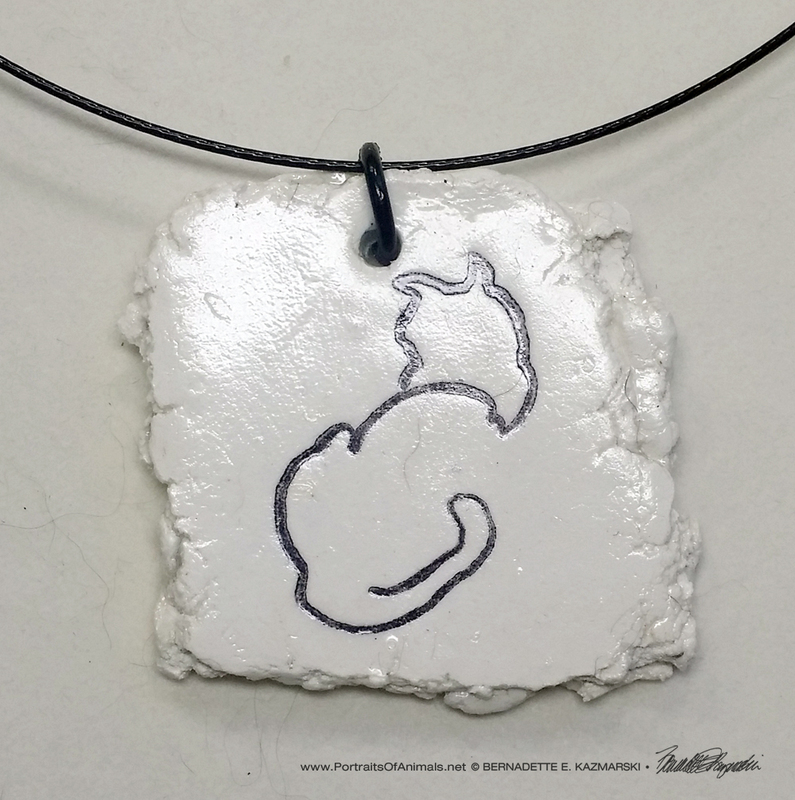 “Back to Front” pendant, 1.5″ x 1.5″ random on wire cord. “Back to Front” pendant, 1″ x 1″ square. 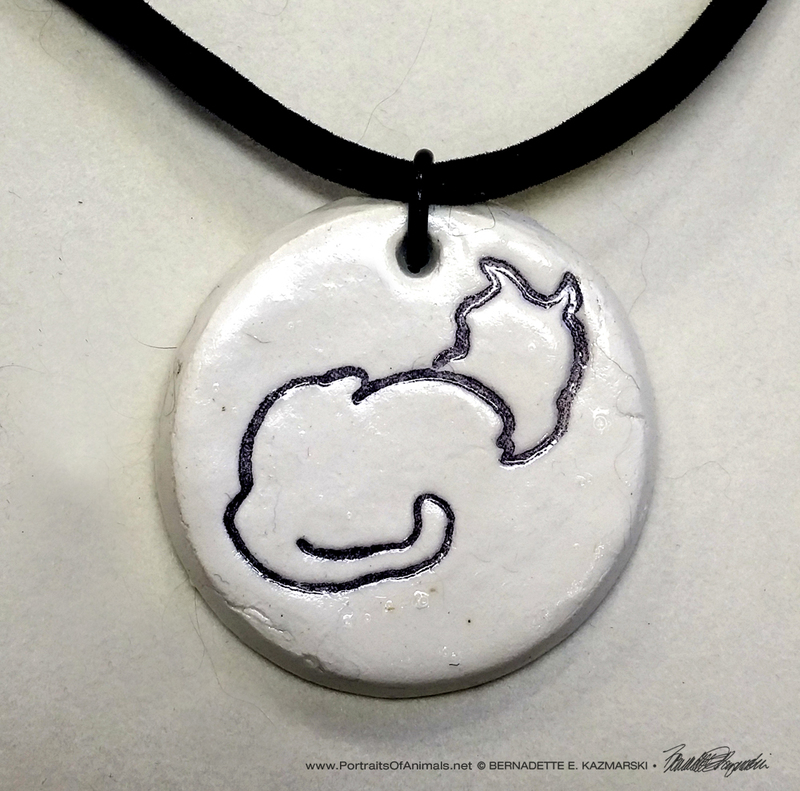 This small pendant is made of air-dry clay with a print of my sketch “Back to Front” impressed in the clay and finished with a gloss varnish. It comes in four different shapes with a little variation in size from 1″ to 1.5″, and comes with three choices of cord. Pendant style and cord style are interchangeable. 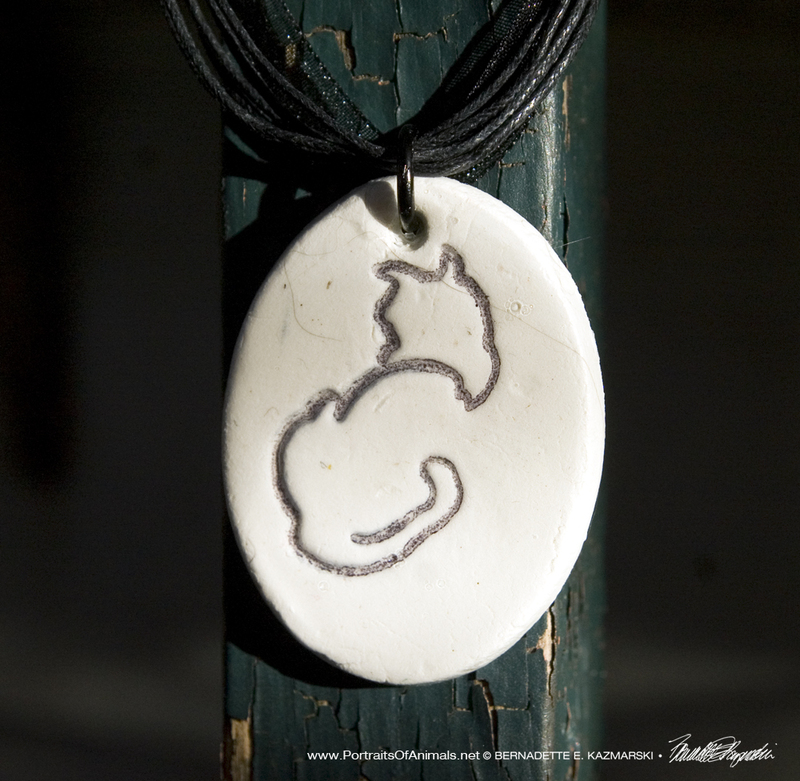 They are made from air-dry clay because I love the smooth porcelain appearance. The clay is made from ground stone and cellulose, which is basically paper pulp, and it is wonderful to work with. The image is my brush pen sketch “Back to Front” and is another project I’ve been considering for a while. I had a rubber stamp made of the image which I will no doubt use as a rubber stamp on paper and things, but I also wanted to be able to ink it up and press it into the wet clay. It worked just as I’d thought, so I see more like this coming in the near future as well as other variations: without ink, different colors of clay, or painted. I’d intended to make only one shape and size and sell it with just a jump ring and piece of ribbon, but once I get into a project I have to explore all the possibilities. I made four shapes, and then I decided to see how it looked on some of the wires/strands/cords available in stores, and when I did I decided to include that as part of the gift–because once I’d seen it I couldn’t *not* include it! 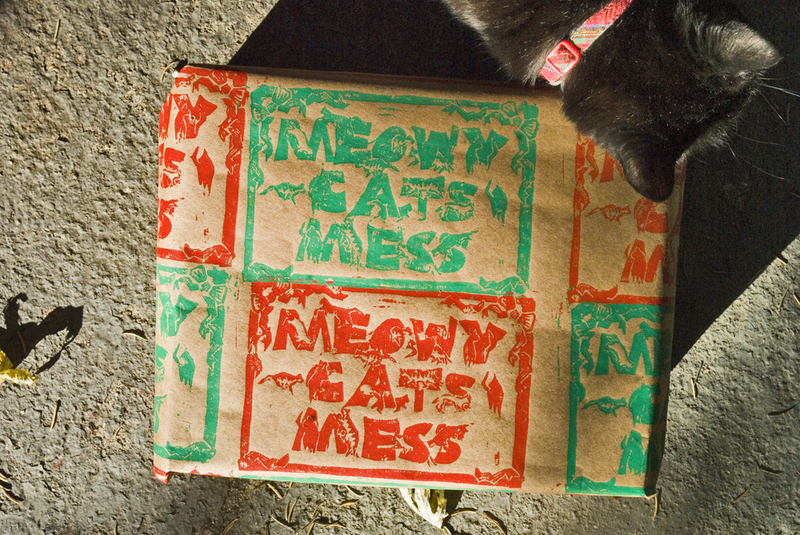 “Meowy Cats Mess” is a linoleum block print, and each sheet of paper is hand-printed on 100# Kraft paper, about 18″ x 24″. I sell larger sheets at 24″ x 30″, but they were too big to wrap your packages! 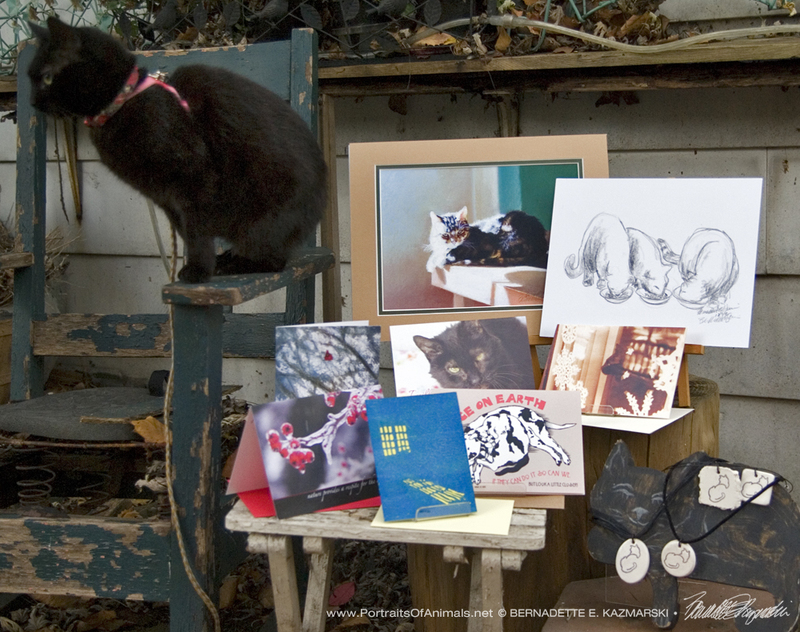 Use the prints and cards for yourself, gifts or donations to help cats. 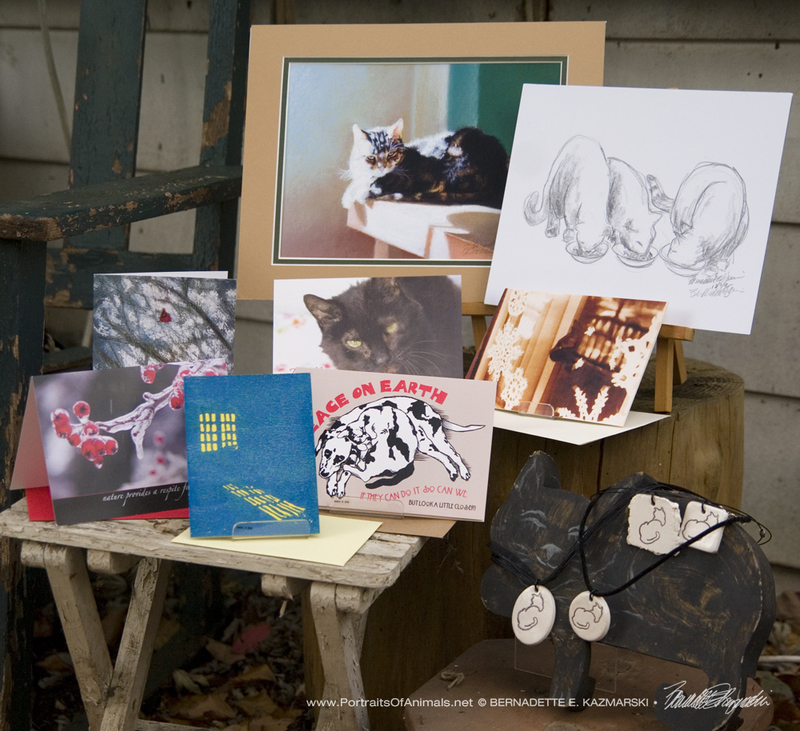 Any of the prints, whether the main print or a framed note card, can be given as a gift to a family member or friend, or as a thank you to a veterinarian or veterinary technician, pet sitter, groomer or anyone else in your life who would enjoy a cat-themed gift. They can also help other cats by being donated to online auctions or shelter and rescue events to help raise much-needed funds. I use as many environmentally friendly and fully non-toxic materials as possible in my packaging so I use as much recyclable paper as possible, which includes the glassine bag holding your cards. 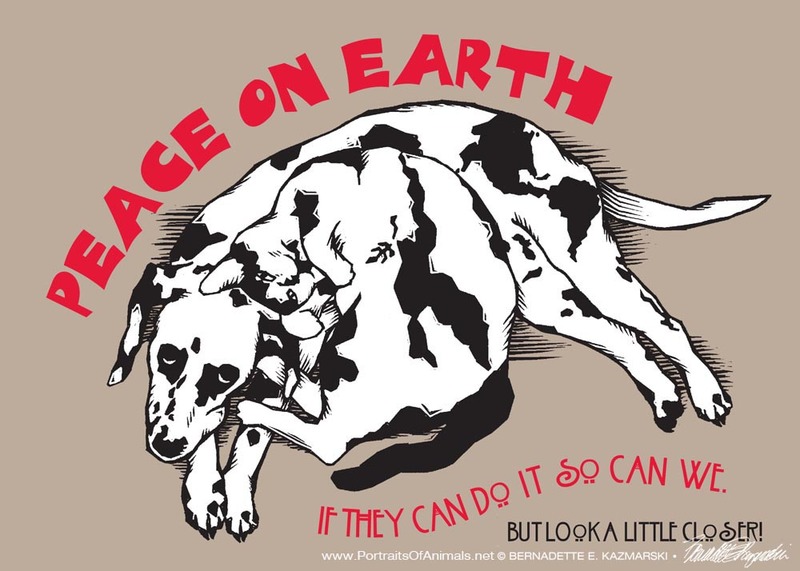 However, on the chance that you may donate or give one of your prints as gift, they are packed in a clear print bag or cellophane wrap depending on their size, and this is not recyclable but you may be able to reuse it.. I both recycle any packaging I get that is clean and reusable, and use as many recyclable materials as possible. Read more here. As mentioned above, these can be things your use for yourself or give as gifts or donation items to shelter or rescue or other fundraisers. Sometimes they’ll be little experiments and I’ll be asking for feedback. I’ll be happy that you get to see art you may have never noticed, and little handmade goods that work so much better in your hands than a photo on your computer. Browse other feline-themed holiday cards and nature-themed holiday cards. Read about other Feline Sampler Boxes on Portraits of Animals. You can purchase any prior Feline Sampler Box. When I send them originally I only put together as many as were ordered, but unless I am completely out of a special handmade item I usually have all the contents here in my studio, though I do have to cut new mats for the artwork and print the wrapping paper. They cost a little more than the original because the extra time it takes to put one together, and when I ship several similar packages at once I get a discount. This entry was posted in animal sympathy cards, animal-inspired merchandise, black cats, cat artwork, cat greeting cards, cat merchandise, feline artwork, Feline Sampler Box, Gift Items, greeting cards, Handmade Feline Gift Items, handmade gift items, linoleum block prints, note cards and tagged animal artwork, black cat, black cats, cat art, cat artwork, cat gift items, cat merchandise, cats, digital prints, feline artwork, feline sampler box, september 2016 Feline Sampler Box on November 14, 2016 by Bernadette.